Writing. For trainers and learning professionals, it can be a lot more challenging than it seems. Transforming information into an enjoyable learning experience is a delicate task and that’s only the tip of the iceberg. Avoiding typos, forming a clear structure, developing the tone you want to set for your content - it’s a lot to consider. Time and practice are incredibly helpful when you’re creating eLearning course content. But, you can also up your writing game by availing of some fantastic tools. Let’s dive into some of the best writing tools we use here at LearnUpon and what we recommend our customers use to hone their course writing skills. For writing that needs group collaboration and editing, we’re big fans of Google Docs. It’s particularly handy if your business uses G Suite as your team will already have access. You can write up your eLearning course content and share it with teammates so they can edit and suggest changes. Most importantly, everyone is working from an up-to-date document so there’s no need for version tracking or risk of people accessing out of date drafts. Part of the Office 365 subscription, Microsoft Word has been around for years and it’s still one of the top writing applications. Similarly to Google Docs, Word has some co-authoring functionality so you can collaborate with your team. It also has some convenient additional writing features such as an inbuilt thesaurus, grammar and spell check, making it a comprehensive tool. Draft is based on a simple concept - write better. Its clean design means distraction-free writing, and it autosaves your work. Your team can collaborate, add notes, add to-do sections, footnotes and more. Free to use, it's the perfect tool to draft up the text for your eLearning content. Explaining complex topics or trying to clarify a difficult subject is tricky. And it’s something that you have to be incredibly mindful of when writing eLearning courses. That’s where Hemingway helps. It gives your writing a readability score, highlights sentences that are difficult to read and suggests alternative phrases to replace complicated ones. It keeps your eLearning content clear, concise and on message. Best of all, it’s free! 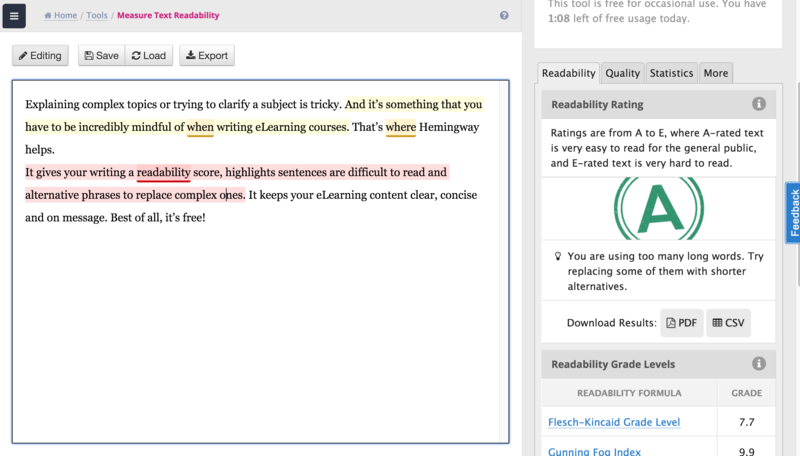 While Hemingway is a more than competent free option, Readable.io is a paid option for pros. It’s packed full of features that can help trainers create more succinct, yet impactful courses. Copy and paste in your text and it’s analyzed, given a Flesch Reading Ease score, text quality breakdown, and more. You also receive a Readability Rating from ‘A - E’ so it’s easy to know just how clear your material is. Well-known and well-reviewed for good reason, Grammarly is one of our preferred grammar checking tools. It points out spelling errors, forgotten commas, misused prepositions and more. And it explains why something is wrong so you learn from your mistakes. Each week you receive a ‘Weekly Progress Report’ email giving you an insightful overview of your activity within the app too. The app starts free, but it also has a premium plan that offers great additional features. WhiteSmoke’s English grammar checker software is a superb tool to proofread your eLearning content. It’s available on desktop, mobile, and web app so no matter where you’re typing, you’ll be typo-free. You’re provided with different price packages and you choose based on your particular needs. They also have handy video tutorials on their website that provide quick tips to improve how you write. A bit of a hybrid, Prowritingaid is “a grammar guru, style editor, and writing mentor in one package.” The product offers you grammar suggestions, editing tools and a few great extras like a dictionary, thesaurus and more. A more robust tool, it’s great for checking text heavy eLearning content. When writing you often find yourself getting into bad habits. And using the same words over and over again is one of them. That’s where WordCounter lends a hand. 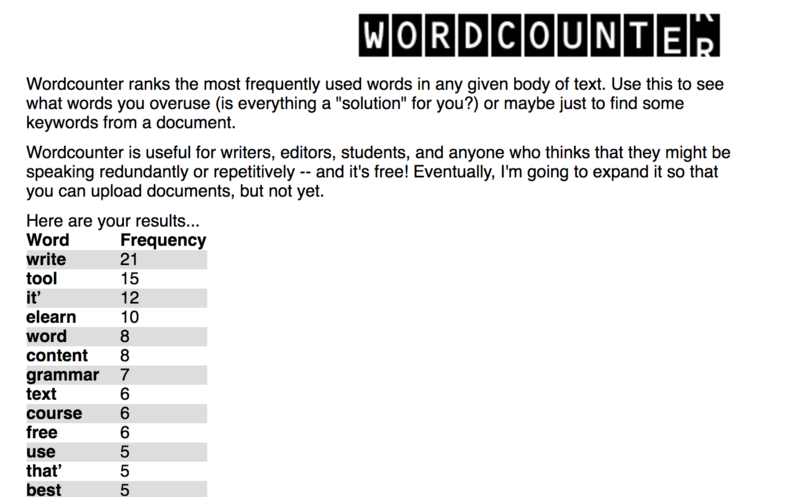 Simply copy and paste your text and it lists your most frequently used words. This way you can see where you’re being repetitive and make changes to avoid your course text content being monotonous for your learners. Get further help avoiding repeated words with Thesaurus.com. Paste in the word you want to find synonyms for and it throws you back loads of alternatives. Power Thesaurus is a crowdsourced synonyms tool that’s also a favorite of ours. It’s straightforward and uncluttered so finding the words you need is effortless. That’s our list of writing tools. We think they are pretty great and we hope you do too. If we missed out on your favorite or you have one that you think will benefit other trainers, please let us know in the comments. We’d be delighted with the recommendation.